Heat oven to 375°F. In 10-inch skillet, heat oil over medium-high heat. Add beef; sprinkle with thyme and pepper. Cook 5 to 7 minutes, stirring occasionally, until beef is browned. Meanwhile, in large bowl, mix remaining ingredients except biscuits and parsley. Stir beef into vegetable mixture. Pour into ungreased 13x9-inch (3-quart) glass baking dish. Cover dish with foil. Bake 28 to 30 minutes or until bubbly around edges. Cut each biscuit into 4 pieces. Place biscuit pieces evenly on beef mixture, leaving space between pieces. Bake uncovered 14 to 18 minutes longer or until biscuits are golden brown. Sprinkle with parsley. 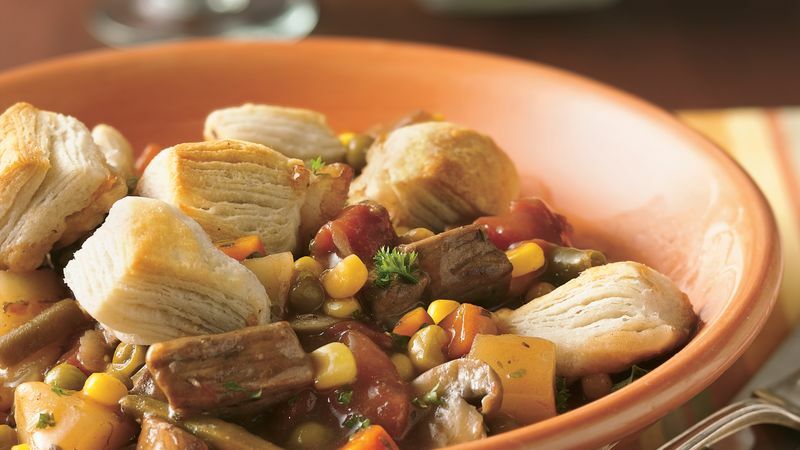 Next time, use beef stew meat instead of round steak. Enjoy this casserole with purchased salad greens tossed with a balsamic vinaigrette.